The MEGA-TMS™ system incorporates the highest maximum voltage rating capacitor (2800 V) in the industry, allowing generation of high power monophasic stimuli. Pair with the Neural Navigator system to categorically improve targeting of desired brain regions. 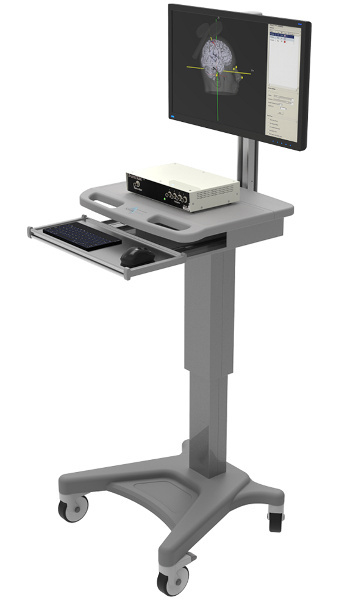 The Neural Navigator Navigated MEP (NavMEP) integrates EMG recordings with the high precision navigation system of the Neural Navigator. 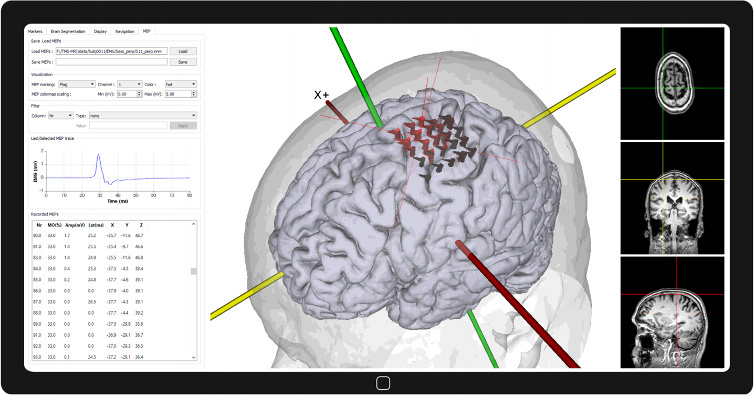 The Neural Navigator NavMEP is designed to map the functional motor area onto the brain surface, using MRI-guided neuronavigation, monophasic Transcranial Magnetic Stimulation (TMS) and simultaneous electromyography (EMG) recordings. 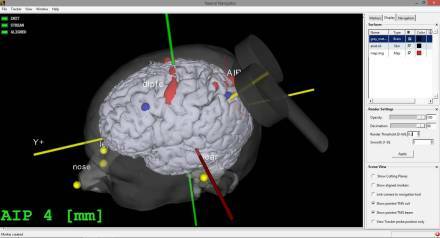 The functional motor maps can be used for monitoring of neural changes during stroke rehabilitation. 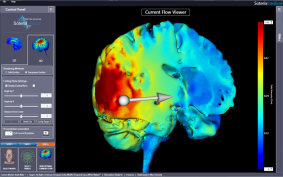 The NavMEP records the stimulated brain region, the stimulation intensity and the features of the motor-evoked potential. It integrates this information and presents it as an intuitive functional motor map onto the brain surface. 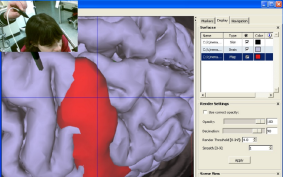 The NavMEP offers high precision neuronavigation integrated with focal monophasic TMS and high quality EMG recordings. The software contains a built-in segmentation algorithm in order to obtain the brain surface from raw MRI images. 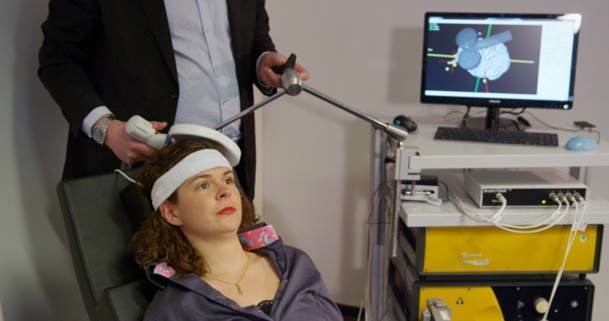 The neuronavigation device allows uninterrupted tracking of both the TMS coil and the head. The net result therefore is a fundamental advance in Neuronavigation – a system that matches the precision and accuracy of optical systems while not being affected by LOS occlusion and is more affordable. No two brains are alike, making precision placement of the coils used in TMS Therapy tricky. Precise and reliable positioning can make the difference between a successful result and an unsatisfactory one. Conventional coil placement is done using anatomical landmarks like the bridge of the nose, the projecting part of the back of the skull, etc. to align the coil over an intended brain target. This is called the “non-navigated approach." This approach does not need the patient’s MRI. Figure 2. Change in Montgomery-Asberg Depression Rating Scale (MADRS) scores (least square means) over time. Figure on left from "A randomized trial of rTMS targeted with MRI based neuro-navigation in treatment-resistant depression” Fitzgerald PB, Hoy K, McQueen S, et al. Neuropsychopharmacology 2009. Precision of 4mm or better. Spatial accuracy better than 1 mm. Universal TMS compatibility with coil sockets available for Magstim, Magventure, and Neurosoft TMS coils. Customization available for TMS coil from other manufacturers. Import of standard MRI data types (Nifti, Analyze, and DICOM). 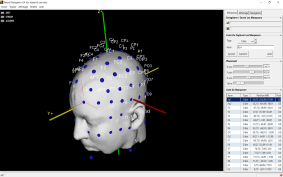 3D MR constructed scalp, brain and activation (fMRI) data. Complete setup fits in a small suitcase making it ideal for bed-side investigation and easy transportation. S.F.W. Neggers, R. Langerak, R. Mandl, D. Schutter, P.J.J. Lemmens, A. Postma & N.F. Ramsey. A stereotactic method for image guided transcranial magnetic stimulation validated with fMRI and motor evoked potentials. NeuroImage 2004/ 21 (4), 1805-1817. JM Jansma, TR van Raalten, R Boessen, SF Neggers, RH Jacobs, RS Kahn, NF Ramsey. fMRI Guided rTMS Evidence for Reduced Left Prefrontal Involvement after Task Practice. PLoS One. 2013; 20;8(12):e80256. Upon request, Soterix Medical support team can provide assistance and advice in MR image processing and MRI data quality inspection.